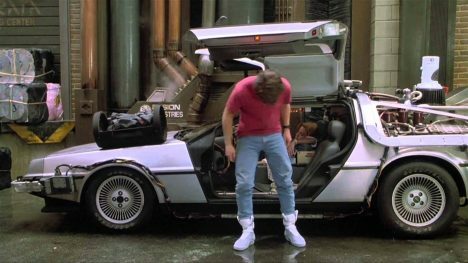 Just in time to hit the pre-holiday purchasing rush, Marty McFly’s famous footwear from Back to the Future will be available to buy starting at the end of November. 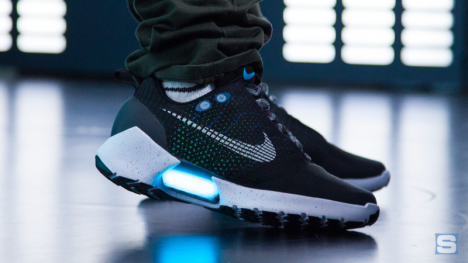 The HyperAdapt 1.0 is going to carry a high price tag (yet unannounced), but heck, it will lace itself, too. 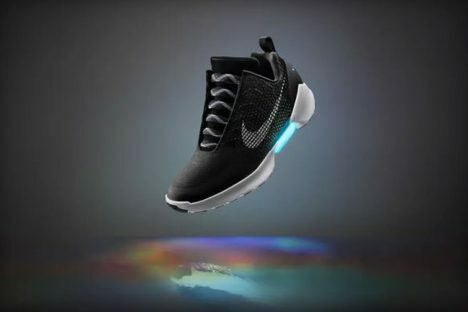 Each shoe has a cable system using fishing line and a pressure sensor – when you put in, the cable tightens based on an algorithmic pressures equation. This can be further adjusted via buttons in the tongue. And yes, it takes power, so LEDs in the heel light up when loosening or tightening but also as a low-battery warning. A single charge will take a few hours but last weeks and can be achieved through a clip-on charger (like the Apple Watch). So why does it still have laces? Those are just for the visuals – they loosen and tighten but just reflect the hidden mechanism doing the actual loosening and tightening below. Replicas and props have been released before, but these are the real deal: they will work, even if they cost a pretty penny. See more in Industrial Design or under Technology. October, 2016.